Once Rwanda's largest city, Butare (also known as Huye) is considered the intellectual capital of the country in contrast to Kigali's political supremacy. It is home to several important Rwandan landmarks, including the Christian Cathedral and the national University of Rwanda. 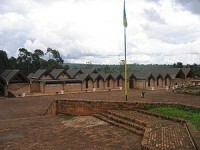 The two most popular attractions in Butare, however, are the National Museum of Rwanda, which chronicles the cultural history of the region through displays of photos and traditional artefacts; and Nyanza, the traditional seat of Rwanda's feudal monarchy, site of the restored 19th-century Royal Palace. The palace at Nyanza is home to the Rwesero Art Museum, Olympic Academy, Sport Museum, Cultural Centre, and stadiums of various sports.